GUD Filters manufactured its first filter in Durban in 1949. As the automotive industry evolved so the company expanded over time to become the market leader in South Africa in automotive and heavy-duty oil and fuel filters. With a range in excess of 3000 part numbers, GUD Filters constantly strives to ensure that it has filters for every vehicle model on South Africa's roads. 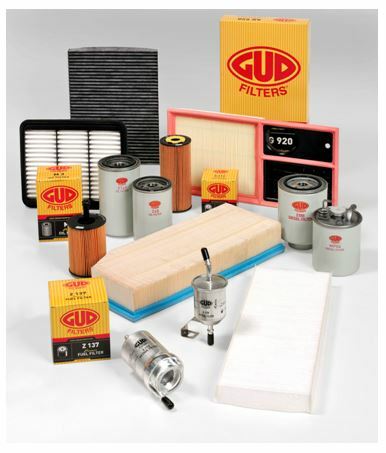 Boasting an extensive variety of oil, fuel, air, and pollen filters, GUD filters are manufactured to OE specifications. The company has established export markets in Australia, Germany, the US, Canada, Brazil, Chile and sub-Saharan Africa and also manufactures filters under original-equipment brand names for most South African vehicle manufacturers. GUD is a proudly South African company that is committed to supporting local suppliers and local sources of raw materials since 2002. GUD further supports South Africa's economy through employment opportunities and adhering to fair labour practices. In 2013 GUD was honoured with the Proudly South African Enterprise award at the Inaugural SA Premier Business Awards. GUD places great emphasis on quality to exceed the requirements of all its market. The GUD Filters quality system is regularly assessed by the South African Bureau of Standards to TS 16949: 2009. The quality system, products and processes are audited regularly by OEMs to ensure their specific requirements are met and to this end, GUD has achieved the coveted Ford Q1 Status. The company's dedication to quality and customer satisfaction cultivates a team ethic that extends throughout the company, and includes suppliers of raw materials and services. A supplier development programme encompassing quality, productivity and costing issues is vigorously pursued. The effectiveness of the entire GUD quality system and its quality ethic has been a cornerstone of the company since its inception; thereby ensuring products consistently perform to the highest standards. GUD adopts a strict Occupational Health, Safety and Environmental policy and were awarded the internationally recognized ISO14001:2004 environmental management system compliancy certificate. Key elements of these policies and procedures are the prevention of pollution, the preservation of natural resources, the management and minimization of waste, compliance with applicable environmental legislation and a process of continual improvement in environmental practices. GUD has also received ISO 14001:2004 accreditation for Environmental Management Systems, with all manufacturing sites conforming to the standards of the system. GUD firmly believes in taking the utmost care in looking after the environment, and the ISO 14001 accreditation is testament to this; pertaining to all activities, practices and services controlled or influenced by the company. The benefits have been immense and have taught personnel the value of recycling and preventing pollution in any way, shape or form. As brand leaders, GUD Filters promises motorists great engine protection and sets the pace and standards in the industry when it comes to innovative and outstanding value-added marketing practices. Our GUD Auto Detox programme which was launched in 2009, offers motorists a quick valued added oil and filter change between regular vehicle services to prolong engine life on todays congested roads. The GUD AUTO DETOX programme has grown from strength to strength over the years and has a dedicated website, www.gudautodetox.co.za to direct motorists to Workshops that offer GUD AUTO DETOX. GUD Filters is a socially responsible company with an investment programme in place that is committed to uplifting its surrounding disadvantaged communities. Zenzele Junior Primary School in Folweni are the primary beneficiary of the social investment programme. The school had a shortage of desks that required as many as three students to share one desk. GUD responded by donating ergonomically designed lapdesks, that fit neatly onto a student's lap. In addition, together with Project Build, GUD provided the tools and manpower to extensively renovate the classrooms at Zenzele Junior Primary School. The interior and exterior of classrooms were repainted, windows were replaced and the school grounds were cleaned up. Zenzele Junior Primary School is an ongoing project, with GUD Filters committed to providing continued support to the school and its surrounding community into the future. Full Name of Company: GUD Filters (Proprietary) Ltd. Nature of Business: Our company, founded on the strength of the GUD brand, specialises in the marketing, manufacture and distribution of an extensive range of quality automotive filters. We will be a responsive manufacturer and supplier of Automotive filters focused on protecting our brands, expanding our range and growing our market share in South Africa, Africa and strategic international markets.